“Present your case,” says the Lord. Verses 22 and 23 explain Idols are unable to tell history in advance. God further laughs and scoffs at those who carve idols, then burn the remaining wood to roast their meals. Again as in Isaiah 41 God reassures Israel which becomes the greater need as the end from the beginning told only by God comes to be, before our eyes as he has said, long in advance. Cain killed his brother, God sentenced him to a wandering in the earth. So Cain dug foundations and built a city in protest. The next foundation we find come after the flood. Nimrod built the tower at Babel and challenged God. Jesus came and with full knowledge some had him killed. A few hundred years ago a centuries long scheme was begun to prepare to do away with his now billions of disciples through a one world religion and global government and economy. They plan to gather together and stop Jesus from taking his place in Jerusalem as King. Chris Queen 2/21/2016 Please hit the Follow Key above and to the right for future updates. Please leave your valued comments here below. 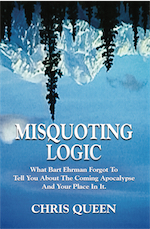 The things God spoke end from the beginning are laid out with detail in my books Misquoting Logic and Misquoting Calculus by Chris Queen BSME on Amazon and the rest.